Looking for delicous healthy snack ideas for your lacrosse player and family? You need to look no further than BobbySue’s Nuts. BobbySue’s Nuts, a company that supports and has ties to Southern California lacrosse read this article: (Nuts for Lacrosse, Nuts for Animals and Nuts for … Nuts) was chosen as a top, healthy snack item by Consumer Reports. According to the nutrition experts at Consumer Reports, a healthy snack comes in at or below 200 calories, 5 grams of fat, 480 milligrams of sodium, and 12 grams of added sugars. Ideally, the snack would have a clean ingredients list, with the majority of the ingredients being real foods, like fruit, nuts, yogurt, whole grains, and vegetables. These come in many flavors, but Nuts Over Olives is an interesting mix of almonds, cashews, pecans, and dried olives. They taste salty and a little sweet. One ounce has 160 calories, 11 grams of fat (the healthy kind from the nuts and olives) and just 5 grams of added sugars. BobbySue’s Nuts was born from a generations-old family recipe for irresistible spiced nuts, and every batch is handmade in New York’s Hudson Valley. BobbySue’s Nuts are dry roasted, made with organic, cage-free egg whites and are always gluten free and non-GMO certified. 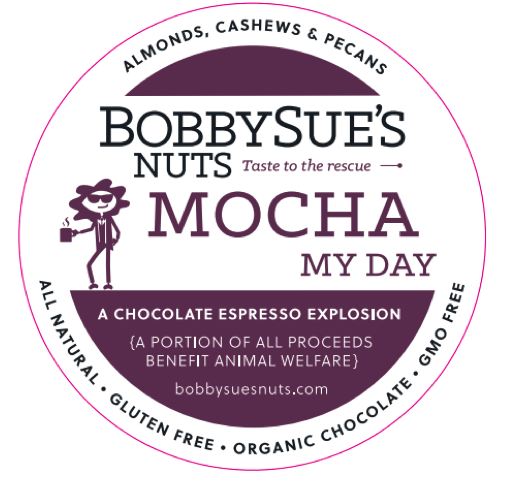 BobbySue’s Nuts is driven by a handful of food enthusiasts who set out to create the most delicious artisanal nut blends on the planet, fueled by a passion for finding shelter for homeless animals. Yum! Look for these exciting flavors at all Whole Foods Markets and other fine retailers (in BobbySue’s Nuts branded plastic tubs in the cheese/deli section), or at www.BobbySuesNuts.com Original, Some Like it Hot, It’s Raining Chocolate, Nuts Over Olives, and Mocha My Day (new! ).